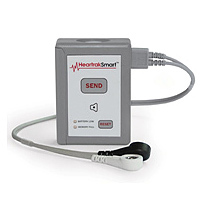 The Heartrak Smart is a lightweight, easy-to-use cardiac event monitor. The Heartrak Smart features 1,200 seconds (twenty minutes) of EKG memory and programmable features that allow it to be adapted to every patient’s monitoring needs. In addition, patients have the option to wear the monitor on their waists as they would a pager, in their shirt pockets or around their necks on a cord. This will ensure that patient comfort is maximized.